To the conservative and compromising, these arguments seemed conclusive. But there was another class that did not so judge. The fact that these customs “tended to bridge over the chasm between Rome and the Reformation” (Martyn, volume 5, page 22), was in their view a conclusive argument against retaining them. They looked upon them as badges of the slavery from which they had been delivered and to which they had no disposition to return. They reasoned that God has in His word established the regulations governing His worship, and that men are not at liberty to add to these or to detract from them. The very beginning of the great apostasy was in seeking to supplement the authority of God by that of the church. Rome began by enjoining what God had not forbidden, and she ended by forbidding what He had explicitly enjoined. At the opening of the seventeenth century the monarch who had just ascended the throne of England declared his determination to make the Puritans “conform, or . . . harry them out of the land, or else worse.”—George Bancroft, History of the United States of America, pt. 1, ch. 12, par. 6. Hunted, persecuted, and imprisoned, they could discern in the future no promise of better days, and many yielded to the conviction that for such as would serve God according to the dictates of their conscience, “England was ceasing forever to be a habitable place.”—J. G. Palfrey, History of New England, ch. 3, par. 43. Some at last determined to seek refuge in Holland. Difficulties, losses, and imprisonment were encountered. Their purposes were thwarted, and they were betrayed into the hands of their enemies. But steadfast perseverance finally conquered, and they found shelter on the friendly shores of the Dutch Republic. In their flight they had left their houses, their goods, and their means of livelihood. They were strangers in a strange land, among a people of different language and customs. They were forced to resort to new and untried occupations to earn their bread. Middle-aged men, who had spent their lives in tilling the soil, had now to learn mechanical trades. But they cheerfully accepted the situation and lost no time in idleness or repining. Though often pinched with poverty, they thanked God for the blessings which were still granted them and found their joy in unmolested spiritual communion. “They knew they were pilgrims, and looked not much on those things, but lifted up their eyes to heaven, their dearest country, and quieted their spirits.”—Bancroft, pt. 1, ch. 12, par. 15. In the midst of exile and hardship their love and faith waxed strong. They trusted the Lord’s promises, and He did not fail them in time of need. His angels were by their side, to encourage and support them. And when God’s hand seemed pointing them across the sea, to a land where they might found for themselves a state, and leave to their children the precious heritage of religious liberty, they went forward, without shrinking, in the path of providence. “Brethren, we are now erelong to part asunder, and the Lord knoweth whether I shall live ever to see your faces more. But whether the Lord hath appointed it or not, I charge you before God and His blessed angels to follow me no farther than I have followed Christ. If God should reveal anything to you by any other instrument of His, be as ready to receive it as ever you were to receive any truth of my ministry; for I am very confident the Lord hath more truth and light yet to break forth out of His holy word.”—Martyn, vol. 5, p. 70. “For my part, I cannot sufficiently bewail the condition of the reformed churches, who are come to a period in religion, and will go at present no farther than the instruments of their reformation. The Lutherans cannot be drawn to go beyond what Luther saw; . . . and the Calvinists, you see, stick fast where they were left by that great man of God, who yet saw not all things. This is a misery much to be lamented; for though they were burning and shining lights in their time, yet they penetrated not into the whole counsel of God, but were they now living, would be as willing to embrace further light as that which they first received.”—D. Neal, History of the Puritans, vol. 1, p. 269. “Remember your church covenant, in which you have agreed to walk in all the ways of the Lord, made or to be made known unto you. Remember your promise and covenant with God and with one another, to receive whatever light and truth shall be made known to you from His written word; but withal, take heed, I beseech you, what you receive for truth, and compare it and weigh it with other scriptures of truth before you accept it; for it is not possible the Christian world should come so lately out of such thick antichristian darkness, and that full perfection of knowledge should break forth at once.”—Martyn, vol. 5, pp. 70, 71. It was the desire for liberty of conscience that inspired the Pilgrims to brave the perils of the long journey across the sea, to endure the hardships and dangers of the wilderness, and with God’s blessing to lay, on the shores of America, the foundation of a mighty nation. Yet honest and God-fearing as they were, the Pilgrims did not yet comprehend the great principle of religious liberty. The freedom which they sacrificed so much to secure for themselves, they were not equally ready to grant to others. “Very few, even of the foremost thinkers and moralists of the seventeenth century, had any just conception of that grand principle, the outgrowth of the New Testament, which acknowledges God as the sole judge of human faith.”— Ibid., vol. 5, p. 297. The doctrine that God has committed to the church the right to control the conscience, and to define and punish heresy, is one of the most deeply rooted of papal errors. While the Reformers rejected the creed of Rome, they were not entirely free from her spirit of intolerance. The dense darkness in which, through the long ages of her rule, popery had enveloped all Christendom, had not even yet been wholly dissipated. Said one of the leading ministers in the colony of Massachusetts Bay: “It was toleration that made the world antichristian; and the church never took harm by the punishment of heretics.”— Ibid., vol. 5, p. 335. The regulation was adopted by the colonists that only church members should have a voice in the civil government. A kind of state church was formed, all the people being required to contribute to the support of the clergy, and the magistrates being authorized to suppress heresy. Thus the secular power was in the hands of the church. It was not long before these measures led to the inevitable result —persecution. Eleven years after the planting of the first colony, Roger Williams came to the New World. Like the early Pilgrims he came to enjoy religious freedom; but, unlike them, he saw —what so few in his time had yet seen—that this freedom was the inalienable right of all, whatever might be their creed. He was an earnest seeker for truth, with Robinson holding it impossible that all the light from God’s word had yet been received. Williams “was the first person in modern Christendom to establish civil government on the doctrine of the liberty of conscience, the equality of opinions before the law.”—Bancroft, pt. 1, ch. 15, par. 16. He declared it to be the duty of the magistrate to restrain crime, but never to control the conscience. “The public or the magistrates may decide,” he said, “what is due from man to man; but when they attempt to prescribe a man’s duties to God, they are out of place, and there can be no safety; for it is clear that if the magistrates has the power, he may decree one set of opinions or beliefs today and another tomorrow; as has been done in England by different kings and queens, and by different popes and councils in the Roman Church; so that belief would become a heap of confusion.”—Martyn, vol. 5, p. 340. Attendance at the services of the established church was required under a penalty of fine or imprisonment. “Williams reprobated the law; the worst statute in the English code was that which did but enforce attendance upon the parish church. To compel men to unite with those of a different creed, he regarded as an open violation of their natural rights; to drag to public worship the irreligious and the unwilling, seemed only like requiring hypocrisy. . . . ‘No one should be bound to worship, or,’ he added, ‘to maintain a worship, against his own consent.’ ‘What!’ exclaimed his antagonists, amazed at his tenets, ‘is not the laborer worthy of his hire?’ ‘Yes,’ replied he, ‘from them that hire him. '”— Bancroft, pt. 1, ch. 15, par. 2. Roger Williams was respected and beloved as a faithful minister, a man of rare gifts, of unbending integrity and true benevolence; yet his steadfast denial of the right of civil magistrates to authority over the church, and his demand for religious liberty, could not be tolerated. The application of this new doctrine, it was urged, would “subvert the fundamental state and government of the country.”— Ibid., pt. 1, ch. 15, par. 10. He was sentenced to banishment from the colonies, and, finally, to avoid arrest, he was forced to flee, amid the cold and storms of winter, into the unbroken forest. “For fourteen weeks,” he says, “I was sorely tossed in a bitter season, not knowing what bread or bed did mean.” But “the ravens fed me in the wilderness,” and a hollow tree often served him for a shelter.—Martyn, vol. 5, pp. 349, 350. Thus he continued his painful flight through the snow and the trackless forest, until he found refuge with an Indian tribe whose confidence and affection he had won while endeavoring to teach them the truths of the gospel. Making his way at last, after months of change and wandering, to the shores of Narragansett Bay, he there laid the foundation of the first state of modern times that in the fullest sense recognized the right of religious freedom. 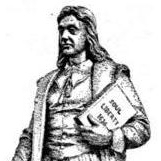 The fundamental principle of Roger Williams’s colony was “that every man should have liberty to worship God according to the light of his own conscience.”—Ibid., vol. 5, p. 354. His little state, Rhode Island, became the asylum of the oppressed, and it increased and prospered until its foundation principles—civil and religious liberty—became the cornerstones of the American Republic. “The framers of the Constitution recognized the eternal principle that man’s relation with his God is above human legislation, and his rights of conscience inalienable. Reasoning was not necessary to establish this truth; we are conscious of it in our own bosoms. It is this consciousness which, in defiance of human laws, has sustained so many martyrs in tortures and flames. They felt that their duty to God was superior to human enactments, and that man could exercise no authority over their consciences. It is an inborn principle which nothing can eradicate.”—Congressional documents (U.S.A.), serial No. 200, document No. 271. As the tidings spread through the countries of Europe, of a land where every man might enjoy the fruit of his own labor and obey the convictions of his own conscience, thousands flocked to the shores of the New World. Colonies rapidly multiplied. “Massachusetts, by special law, offered free welcome and aid, at the public cost, to Christians of any nationality who might fly beyond the Atlantic ‘to escape from wars or famine, or the oppression of their persecutors.’ Thus the fugitive and the downtrodden were, by statute, made the guests of the commonwealth.”—Martyn, vol. 5, p. 417. In twenty years from the first landing at Plymouth, as many thousand Pilgrims were settled in New England. The regulation adopted by the early colonists, of permitting only members of the church to vote or to hold office in the civil government, led to most pernicious results. This measure had been accepted as a means of preserving the purity of the state, but it resulted in the corruption of the church. A profession of religion being the condition of suffrage and officeholding, many, actuated solely by motives of worldly policy, united with the church without a change of heart. Thus the churches came to consist, to a considerable extent, of unconverted persons; and even in the ministry were those who not only held errors of doctrine, but who were ignorant of the renewing power of the Holy Spirit. Thus again was demonstrated the evil results, so often witnessed in the history of the church from the days of Constantine to the present, of attempting to build up the church by the aid of the state, of appealing to the secular power in support of the gospel of Him who declared: “My kingdom is not of this world.” John 18:36. The union of the church with the state, be the degree never so slight, while it may appear to bring the world nearer to the church, does in reality but bring the church nearer to the world. The great principle so nobly advocated by Robinson and Roger Williams, that truth is progressive, that Christians should stand ready to accept all the light which may shine from God’s holy word, was lost sight of by their descendants. The Protestant churches of America,—and those of Europe as well,—so highly favored in receiving the blessings of the Reformation, failed to press forward in the path of reform. Though a few faithful men arose, from time to time, to proclaim new truth and expose long-cherished error, the majority, like the Jews in Christ’s day or the papists in the time of Luther, were content to believe as their fathers had believed and to live as they had lived. Therefore religion again degenerated into formalism; and errors and superstitions which would have been cast aside had the church continued to walk in the light of God’s word, were retained and cherished. Thus the spirit inspired by the Reformation gradually died out, until there was almost as great need of reform in the Protestant churches as in the Roman Church in the time of Luther. There was the same worldliness and spiritual stupor, a similar reverence for the opinions of men, and substitution of human theories for the teachings of God’s word. The wide circulation of the Bible in the early part of the nineteenth century, and the great light thus shed upon the world, was not followed by a corresponding advance in knowledge of revealed truth, or in experimental religion. Satan could not, as in former ages, keep God’s word from the people; it had been placed within the reach of all; but in order still to accomplish his object, he led many to value it but lightly. Men neglected to search the Scriptures, and thus they continued to accept false interpretations, and to cherish doctrines which had no foundation in the Bible. Seeing the failure of his efforts to crush out the truth by persecution, Satan had again resorted to the plan of compromise which led to the great apostasy and the formation of the Church of Rome. He had induced Christians to ally themselves, not now with pagans, but with those who, by their devotion to the things of this world, had proved themselves to be as truly idolaters as were the worshipers of graven images. And the results of this union were no less pernicious now than in former ages; pride and extravagance were fostered under the guise of religion, and the churches became corrupted. Satan continued to pervert the doctrines of the Bible, and traditions that were to ruin millions were taking deep root. The church was upholding and defending these traditions, instead of contending for “the faith which was once delivered unto the saints.” Thus were degraded the principles for which the Reformers had done and suffered so much.